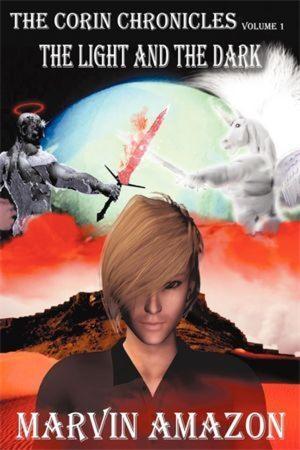 Out of the planet-spanning conflict between Auphora, the God of Gods, and Baran, his rebellious son, comes a war that will determine the fate of planet Corin in The Corin Chronicles: The Light and the Dark, the first installment of a sword-and-sorcery series by Marvin Amazon. The god Baran has been invading planets in his father’s universe in search of the Red Elixir, which will give his children the strength to stand against their cousins in war. When Auphora’s other sons reveal Baran’s plan to their father, Auphora decides that Baran has overstepped his bounds. Corin is the site of the final, titanic battle between the armies of father and son. Auphora halts the planet in its rotation, changing it into Light and Dark Worlds as a reminder of who’s in charge. Baran’s back-up plan consists of having his son Siroco and the boy’s mother, Selena, escape Auphora’s forces so that young Siroco can safely reach adulthood and put in motion his father’s return to Corin. There is no easy road for Siroco and Serena to reach their goal, but they are aided by a spiritually bankrupt yet morally strong warrior, who makes the ultimate sacrifice in order to keep his word to Selena. Thus begins the mythic journey of a god’s son. Siroco is on the run from Auphora’s agents, traveling through one millennium to the next. He manages to stay a step or two ahead of his pursuers until he reaches Earth, where he eludes his foes by dint of his extraordinary powers and continues his quest. The Light and the Dark contains familiar fantasy tropes: monarchy as the political system, magical beings of many kinds, a young man on a quest, the evil sorcerer-adviser, and damsels in distress (perhaps future volumes will introduce female characters who can take care of themselves). An interesting twist in the villain department is the moral ambiguity of both Auphora and Baran. Their actions blur the line between good and evil, leaving the reader unsure of which character is the good guy. Opening a fantasy book with a fierce battle scene between two powerful divinities is used seldom enough that it stands out here. Even better, Amazon’s well-written opening pulls the reader into the events that follow. The multiple planets involved in the story add depth, and the time variations between the main characters give the novel a wider scope than if the story played out in only one world. Minor problems, such as the repeated hands-on-head action of at least three characters, don’t occur frequently enough to halt the reader’s interest. Rich in detail and energized by martial clashes and chase scenes in more than one time period, the first volume in The Corin Chronicles is a promising start to a fantasy series.